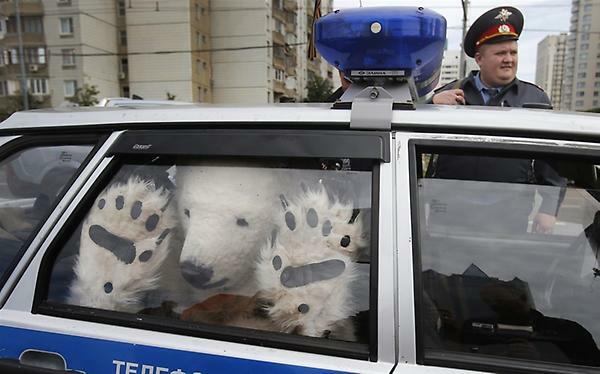 Russian police have something to learn about giving arrestees the chance for a photo op, although I’m glad they haven’t learned it yet. Ironically but not surprisingly, polar bear detainees now get better treatment in the former Soviet Union than here in the somewhat democraticish United States, as we saw a couple of years ago. Those bears, arrested outside congressional offices in 2007, alleged their singing and dancing had not been disruptive and that police had unconstitutionally seized them and “roughly removed their pelts” before arresting them. I wouldn’t say Russia is especially enlightened these days, but at least they aren’t strip-searching their polar bears.